If income is one side of the coin, loss is the other side. When a person earns income, he pays tax.However, when he sustains loss, law affords him to have benefit in the form of reducing the said loss from income earned during the subsequent years. 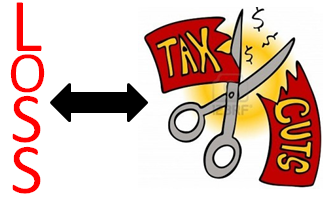 Thus, tax liability is reduced at a later date, if loss is sustained. Certain provisions govern the process of carry forward and set off of loss. Basic Conditions for carry forward of loss. 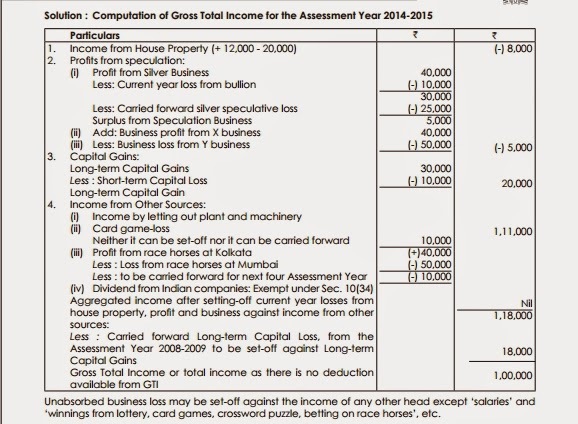 As stated in Section 14 of the Act computation of total income is made under certain heads viz. (i) Salaries (ii) Income from House Property (iii) Profits and Gains of Business or Profession (iv) Capital Gains and (v) Income from Other Sources. In case computation results in to a positive figure, it is “Income.” Likewise, if the computation results into a negative figure, it is ‘Loss”. Therefore, there cannot be loss from the head ‘Salary’. Loss can occur from all the remaining heads. These five heads of income are mutually exclusive. If any income falls under one head, it cannot be considered under any other head. 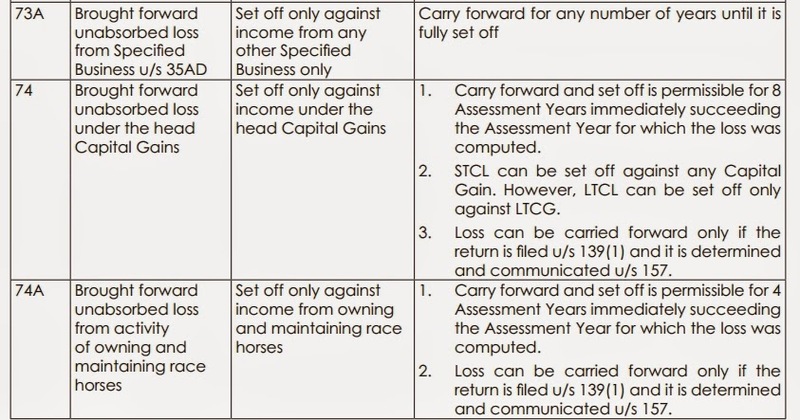 Income under each head has to be computed as per provisions under that head. 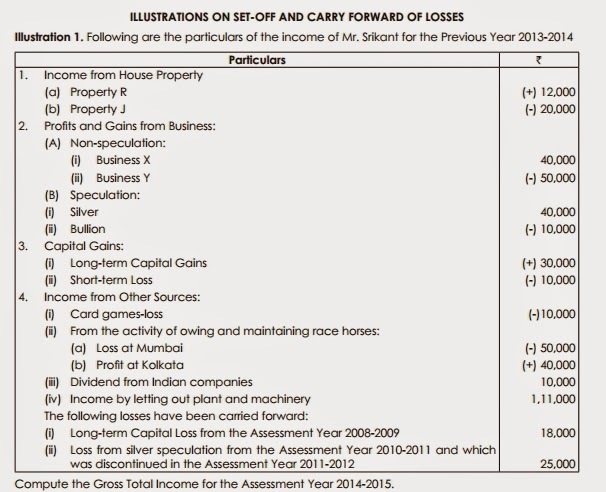 Then, subject to provisions of Set off of Losses (Sec. 70 to Sec. 80) between the heads of income, the income under various heads has to be added to arrive at a Gross Total Income. From this Gross Total Income, deductions under Chapter VIA are to be allowed to arrive at the total income. Where the net result for any Assessment Year in respect of any source falling under any head of income is a loss, the assessee shall be entitled to have the amount of such loss set off against his income from any other source under the same head of income for the Assessment Year. the Assessment Year in respect of any other capital asset. 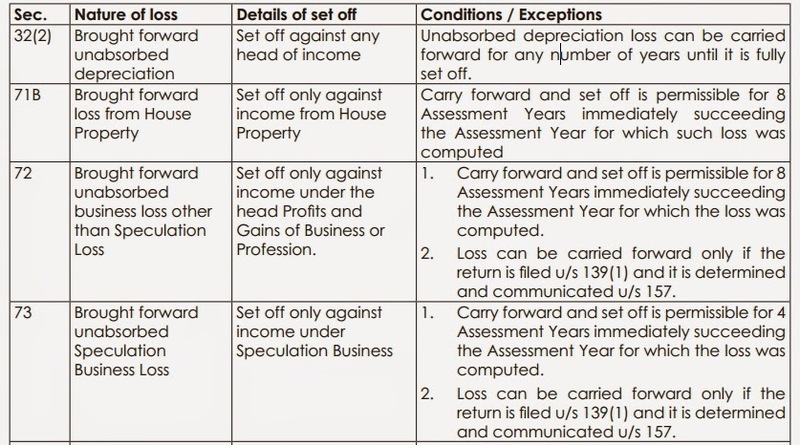 (3) Where result of the computation made for the Assessment Year in respect of speculative business is a loss, the assessee shall be entitled to have the amount of such loss set off against the income, if any, as arrived under a similar computation made for the Assessment Year in respect of speculative business only. in respect of other specified business covered by Section 35AD. business of owning and maintaining race horses. is a loss, the assessee shall be entitled to have such amount of loss set off against his income assessable for that Assessment Year under any other head of income. (a) Loss from Speculation Business: “Speculation transaction” means a transaction in which a contract for the purchase or sale of any commodity including stocks and shares is periodically or ultimately settled otherwise than by actual delivery or transfer of the commodity or scripts [Sec. 43(5)]. Loss from speculative transaction, if it is in the nature of business, can be set off only against income of another speculative business. (b) Loss under the head Long Term Capital Gains: Long Term Capital Loss arising from transfer of longterm capital assets will be allowed to be set off only against Long Term Capital Gains. Loss can be set off against deemed income. Inter head adjustment is made only when the net income computed under a head is a loss. The scheme of inter source and inter head adjustment is mandatory. (c) Loss from owning and maintaining race horses: Loss from owing and maintaining race horses can be set off only against income of that activity. exempt cannot be set off against income from a taxable source. (f) Loss from business specified in Section 35AD: Any loss arising from specified business u/s 35AD, cannot be set off against any other income. (g) Loss from business: Loss from business and profession including unabsorbed depreciation cannot be set off against Income from Salary. In order to carry forward loss under section 72, 73, 74 and 74A, return of income to be submitted within the due date as prescribed in Section 139(1). No loss which has not been determined in pursuance of a return filed within the date in accordance with the provisions of Section 139(3) shall be carried forward under the provisions of section. The condition for filing of return in accordance with the provisions of Sec. 139(3) shall not apply to loss from House Property carried forward u/s. 71B and unabsorbed depreciation u/s. 32(2). Brought forward loss of earlier Assessment Year in accordance with Sec.s 72, 73, 74, 74A can be set off against the income of that Assessment Year and can be carried forward further, even if the return is not filed within the due date specified in Section 139(1) of the Act. CBDT has issued Circular vide No. 8 of 2001 dated 16.5.2001 clarifying that the power has been delegated to Commissioner to condone delay in filing return and carry forward losses in cases where the claim for loss does not exceed ` 10,000 for each Assessment Year and to Chief Commissioner/Director General upto ` 1 lakh and beyond such limit CBDT will exercise the power. (ii) the loss, if any, which has not been set off wholly, the amount of loss not so set off, shall be carried forward to the following Assessment Year, not being more than eight Assessment Years immediately succeeding the Assessment Year for which the loss was first computed. Sec 72A: Carry forward and set off of accumulated loss in Scheme of Amalgamation or Demerger or Business Re- organization. with one or more public sector company or companies engaged in similar business. 1. The amalgamating company should have been engaged in the business for three years or more. value of fixed assets for at least two years prior to the date of amalgamation. of the book value of the fixed assets of the amalgamated company acquired on amalgamation. period of at least 5 years. on an application made by the amalgamated company]. If any of the aforesaid conditions are not fulfilled, then the amount of brought forward business loss or unabsorbed depreciation so set off in any Previous Year in the hands of the Amalgamated Company will be deemed to be the income chargeable to tax, the hands of that Amalgamated Company, for the year in which such conditions are not fulfilled. (ii) The amount which bears the same proportion to the accumulated loss or unabsorbed depreciation of the demerged company as the assets of the undertakings transferred to the resulting company bears to the assets of the demerged company if such accumulated loss or unabsorbed depreciation is not directly relatable to the undertakings transferred to the resulting company. specified in Section 72A are applicable to amalgamation only and not to demerger. However, the Central Government may, for the purposes of this section, by notification in the Official Gazette, specify such other conditions as it considers necessary to ensure that the demerger is for genuine business purposes. the Previous Year of such business re-organisation. Notwithstanding anything contained in Section 72(2)(1B)(i)to (iii) where there has been an amalgamation of a banking company with any other banking institution under a scheme sanctioned and brought into force by the Central Government under Sec 45(7)of Banking Regulation Act , 1949 the accumulated loss and the unabsorbed depreciation of such banking company shall be deemed to be the loss or, as the case may be, allowance for depreciation of such banking institution for the Previous Year in which the scheme of amalgamation was brought into force and other provision of this Act relating to set off and carry forward of loss and allowance for depreciation shall apply accordingly. In this case conditions u/s 2(1B) or 72A may or may not be satisfied. 45(15) of the Banking Regulation Act, 1949. (iii) “Banking institution” shall have the same meaning as assigned to it in Sub-section (15) of Section 45(15) of the Banking Regulation Act, 1949.
allowed to such banking company if amalgamation had not taken place. or suffered depreciation. However, one may also find that Sec. 72D is not available to him as the entity in which the loss is incurred does not qualify as an industrial undertaking or that some of the conditions of Sec. 72D are onerous to fulfil. Therefore, to get over these problems, the concept of reverse merger gained momentum. Under a normal merger, it is a sick industrial undertaking that is wound up and merged with a healthy undertaking. Under a reverse merger, a healthy company is merged with the sick company that has losses and unabsorbed depreciation allowances carried forward. Thus, the profits of the healthy company after amalgamation will be available for set off to the losses and unabsorbed depreciation allowances. The sick company that incurred the losses and suffered depreciation allowance will be the same person as the person who will carry them forward and adjust against the profits. Thus, Sec. 72D will not apply and the purpose of set off of losses and unabsorbed depreciation allowances will still be achieved. Based on facts in given cases the route merger of reverse merger will suit some companies. loss and allowance for depreciation shall apply accordingly. fulfils such other conditions as may be prescribed to ensure the revival of the business of the predecessor co-operative bank or to ensure that the business re-organisation is for genuine business purpose. the amount which bears the same proportion to the accumulated loss or unabsorbed depreciation of the demerged co-operative bank as the assets of the undertaking transferred to the resulting co-operative bank bears to the assets of the demerged co-operative bank if such accumulated loss or unabsorbed depreciation is not directly relatable to the undertakings transferred to the resulting co-operative bank. (4) The Central Government may, for the purposes of this section, by notification in the Official Gazette, specify such other conditions as it considers necessary, other than those prescribed under Subclause (iii) of Clause (b) of Sub-section (2), to ensure that the business re-organisation is for genuine business purposes. (6) In a case where the conditions specified in Sub-section (2) or notified under Sub-section (4) are not complied with, the set off of accumulated loss or unabsorbed depreciation allowed in any Previous Year to the successor co-operative bank shall be deemed to be the income of the successor cooperative bank chargeable to tax for the year in which the conditions are not complied with. 72: Carried forward and set-off of business losses other than speculative business. 73: Losses in speculation business. 74: Losses under the head Capital Gains. 74A: Losses from owning and maintaining race horses. remaining unabsorbed. This restriction shall not apply to unabsorbed depreciation. death of any of its partners). or admission of new partners. carried forward and set off against his income. transfer of shares by way of gift to any relative of the shareholder making such gift. (b) W.e.f. AY 2000-01, this section shall not apply to any change in the shareholding of an Indian company which is subsidiary of a foreign company arising as a result of amalgamation or demerger of a foreign company subject to the condition that 51% of the shareholders of the amalgamating or demerged foreign company continue to remain the shareholders of the amalgamated or the resulting foreign company. Notes : Unabsorbed business losses can be carried forward and set off against profits from any business from A.Y. 2000-01. There is no need to continue the same business in which the loss was incurred. In this case, the loss of financial year 2012-13 will not be set off against the profit of financial year 2013-14, since the persons, Bony and Cady, or Bony and Dany or Cady and Dany who hold between them as a pair 51% shares as at the end of financial year 2012-13 do not hold 51% shares at the end of financial year 2013-14. Depreciation can be carried forward and set off against the profits from any business in the succeeding Assessment Year upto A.Y. 2001-02. The business in which the loss was incurred need not be continued in that year. (b) to Sec. 74A]. Thus, where wagering or betting is not lawfully made on race horses, any loss incurred on such betting can neither be set off nor carried forward. Hence, the carried forward loss of ` 2,00,000 cannot be set-off. under the same head of income. 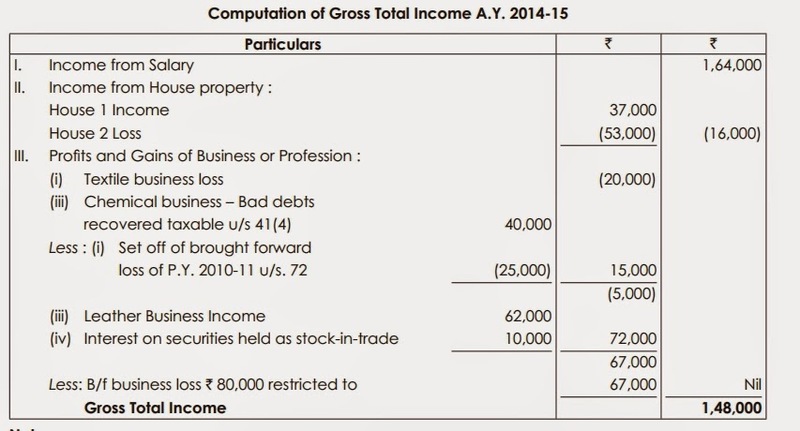 Thus, taxable business profits for the Assessment Year 2014-2015 is ` 1,50,000. The speculation loss will be carried forward for future set-off for 4 Assessment Years, immediately succeeding the Assessment Year for which it was first com puted [Sec. 73(4)]. The time-limit of 4 years is applicable from the Assessment Year 2015-2016 and subsequent year. Illustration 6. D has earned income of ` 5,60,000 from speculation business during the PY 2013-2014. However, he has suffered losses in business and profession ` 3,20,000 and ` 1,70,000, respectively during the same period. 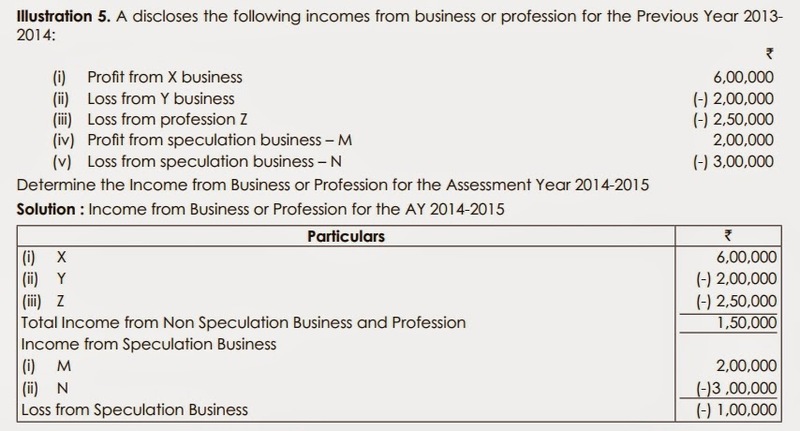 Determine his income from business profession for the Assessment Year 2014-2015. 1. The unabsorbed loss of ` 13,000 (80,000-67,000) of Textile business can be carried forward to A.Y. 2015-16 for setoff u/s. 72, even though the business is discontinued. 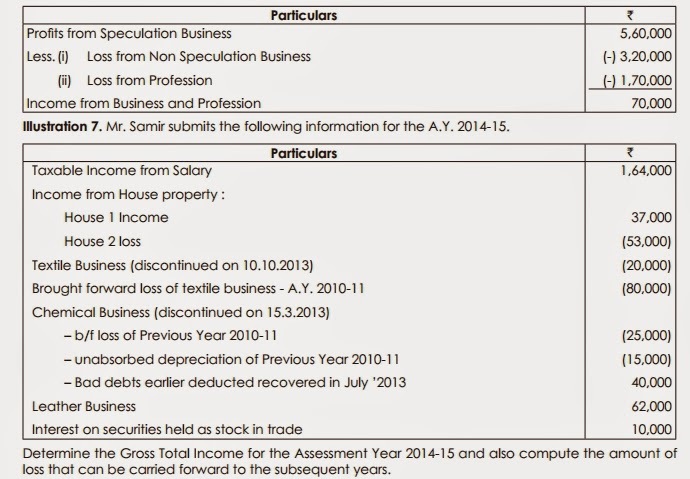 Illustration 8:An assessee has filed a belated return showing a business loss. What is the remedy available to him for carry forward and set off of the said loss? AG Ltd. filed its return of loss for the Assessment Year 2014-2015 on 10.01.2015 beyond the time prescribed u/s 139(3) declaring a total loss of ` 12,00,000. It approaches you for your advice regarding the course of action to be taken to secure the benefit of carry forward of the business loss for set off against future profits. Advise the company suitably. C. Analysis and conclusion: Here, since the loss of AG Ltd. is ` 12,00,000, the authority empowered to condone the delay is CBDT. Hence, AG Ltd. has to file a condonation petition to the CBDT to carry forward the business loss.